Ah, Race 35 of 36. Phoenix, the only time of the NASCAR season where people use the word “penultimate.” What looked like a dominant day by Toyota teams Sunday quickly turned into a drama-filled event with a feel-good finish. 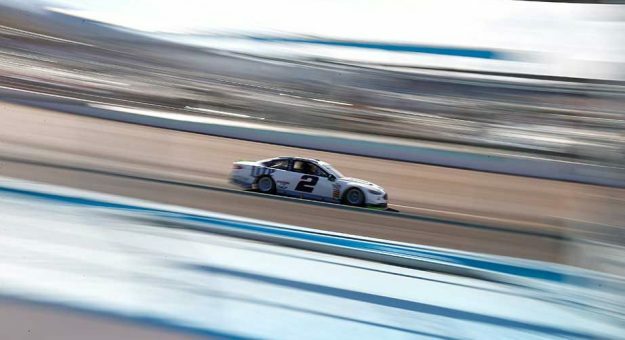 It wasn’t a career race for Brad Keselowski, finishing 16th, but having an unmemorable day is likely what kept him in championship contention heading to Miami. While Denny Hamlin and Chase Elliott watched their championship hopes slip away after a pair of run-ins since Martinsville — Hamlin punted Elliott at “The Paperclip” and Elliott retaliated late in Sunday’s race — Keselowski was the beneficiary of all the drama. Elliott needed to win the race in order to advance to the Championship 4. Hamlin needed to score more points than Keselowski, which it appeared he was on track to do before crashing. Keselowski, meanwhile, had to focus on keeping his car clean so he could finish ahead of Hamlin. Staying away from the drama ended up paying off for Keselowski, who will now race for a championship this week. Thumbs up for #GoingFor2 by staying out of the spotlight — at least for now. When Chris Buescher’s brakes failed on Lap 253, destroying the No. 37, bits of his exploded brake rotors bounced around the track — parts landing in the gap between the SAFER barrier and the concrete wall. Somehow those shards of extremely warm parts led to sections of the wall quite literally catching on fire. Take another look at the cause for the current red flag. The race was stopped for a few minutes to fix the walls, but it’s probably not ideal for walls to catch fire. I guess it adds a unique element of danger, though. After much consideration, burning walls (and brake rotors) earn a thumbs down. The smoke makes it a little difficult to see the racing action. Of course, Matt Kenseth won the race in dramatic, emotional fashion after a championship-affecting late-race pass on Elliott. But Matt wasn’t the only fast Kenseth Sunday afternoon. Yes, it seems Ross Kenseth, Matt’s son, was stopped on his drive home for driving with a little too much gusto. Thumbs up for following in dad’s footsteps. But maybe consider slowing it down, Ross. Kyle Larson, who recently made known his disdain of his 2017 season, found himself in trouble yet again. After winning Stage 1, the engine on his No. 42 quit, resulting in his fourth consecutive DNF and his second engine failure during the playoffs (the other, of course, ended Larson’s championship hopes at Kansas). The good news for Larson is that there’s only one race left this season. Thumbs down for a bad luck streak that could even make Kasey Kahne feel bad. It’s well-documented that Kenseth doesn’t expect to race beyond this week. That’s why his victory at Phoenix, his first in over a year, is an almost-storybook way of going out. Kenseth also performed a ‘Polish Victory Lap’ celebration, the same way he did in his first victory 39 wins and 17 years ago — at the track where fellow Wisconsin native Alan Kulwicki famously performed the first such celebration in 1992. A native of Wisconsin, @MattKenseth performed Alan Kulwicki’s Polish victory lap after his first Cup win (2000 Coke 600) and today. Sure, there’s one race left in 2017 — one more shot for Kenseth to score a victory — but it must feel good to score one just before going out. A giant thumbs up to everybody’s favorite race-winning dad comedian.